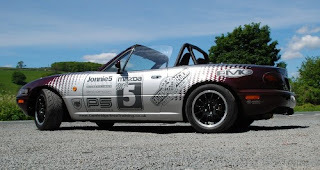 PROJECT Merlot took pride of place on the MX-5 Owners Club stand at JAE 07. 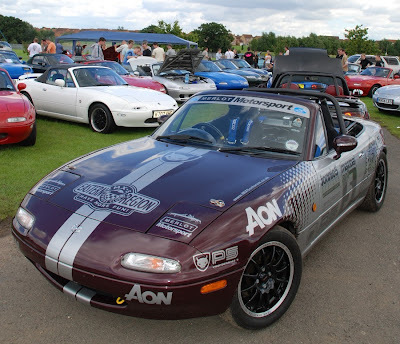 The Japanese Auto Extravaganza is the biggest gathering of Japanese car clubs every year in the UK and features every japanese enthusiasts car imaginable, from the cute Suzuki Cappuccino to the mighty Nissan Skyline. 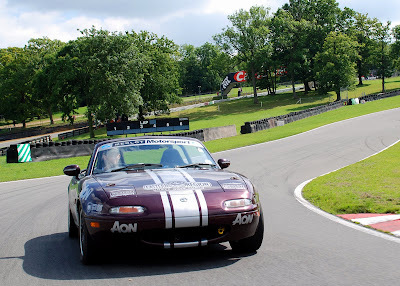 This was the first time the car had been seen out in public proudly carrying the name of AON car insurance who are now supporting the project. 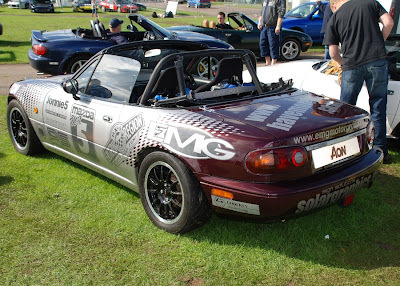 The Merlot also toured the showground and put in an appearance on the Sunday at the MX-5 Nutz stand. 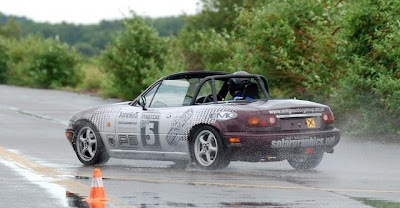 Project Merlot goes stunt driving ! 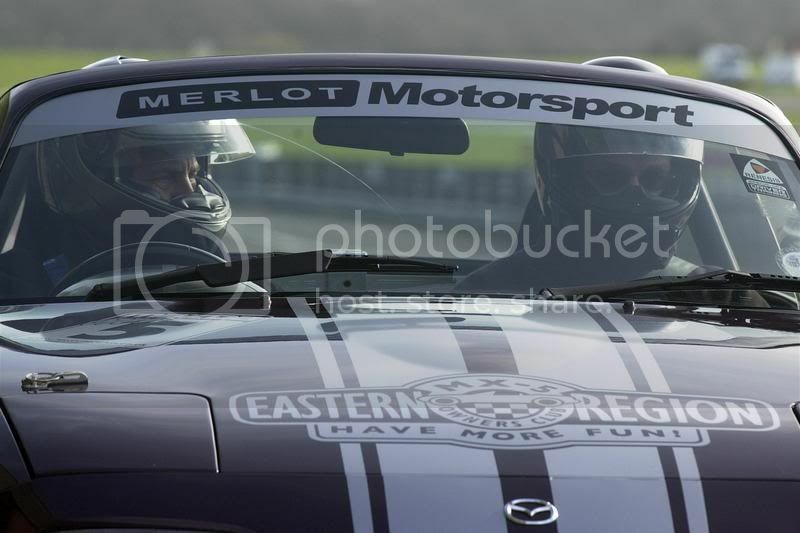 STUNT supremo Russ Swift couldn't resist climbing into the driving seat of the Eastern Region's track car Project Merlot. The world's number one display driver has become a star after wowing audiences of programmes like Fifth Gear and Top Gear and proving to be the skills behind numerous car stunt TV commercials. He also holds three Guinness world records - including parallel parking in the tightest space (just 33cm longer than a car) and the fastest do-nuts (10 complete revolutions in under 15 seconds). 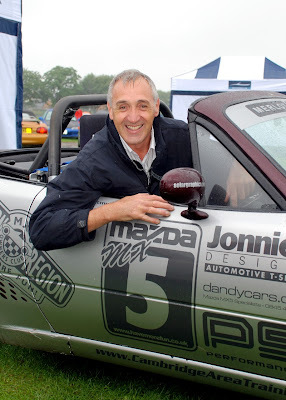 The celebrity precision driver took a moment out of his spectacular show at the 2007 Japanese Automobile Extravaganza at Peterborough to check out Project Merlot and chat to the team. 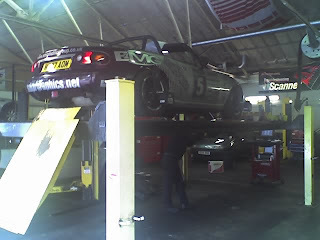 Russ said: "My background is in grassroots motorsport. I used to do autotesting and I've seen with projects just like this, how you can start at the bottom and work your way up." After hearing the car had been rescued from a scrap yard fate for just £50, and rebuilt on a shoestring budget, Russ said: "This is right after my own heart this is. "I love to see it. These days motorsport is so much about money - it's such a big factor in most forms of the sport. I like to see people compete, or just have a go. If they win it's a bonus!" Obviously enthused by the project he chatted about the modifications made to the car and recommended the team consider fitting a limited slip differential to help cornering while on the track. 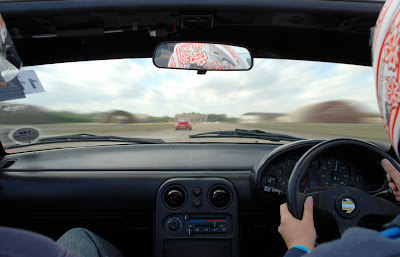 So taken was he by the little roadster that with a mischievous glint in his eye he asked what the handbrake was like. Maybe Russ was angling for a quick spin... Literally! It was back to Woodbridge for another Javelin track day on Saturday 7 July. Drivers today were co-owners Jon and Robbie together with Neil Barber on his second outing to Woodbridge. And the big surprise of the day was the first appearance of Matt Barber who had, due to a knee injury, missed the last couple of Woodbridge outings and had been substituted! For the most part the day was dry but a couple of short showers livened up the track again. Project Merlot had some very welcome company on the day with the second appearance of Ian and Tula Wards new Roadster track tool together with track day regular Brian Hoskins in his SE Gleneagles. Woodbridge is very much our home ground now and we hope to be back soon. Thanks again to Javelin for their faultless organisation. Merlot in the Media - again ! 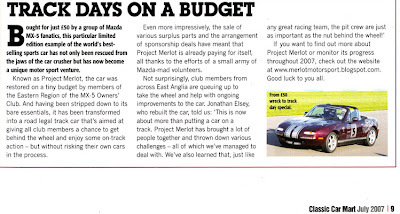 Project Merlot feature in the pages of the July 2007 edition of Classic Car Mart. Saturday 16 June saw Project Merlot and the team make its second visit to Woodbridge Airfield for a track day with Javelin. The day saw a return behind the wheel for co-owners Jon Elsey and Martin Curtis, with new driver Kendra Dixon and second timer Katie Pyle returning after her trip to Curborough sprint. The weather was not quite so kind as on the previous outing to Woodbridge with a couple of heavy showers but fears that the rain would spoil the fun were completely unnecessary as the extra wet track was even more exciting to drive with the lower levels of grip! And to top off the day the car and drivers spent some time on the shorter handing circuit really putting the car through its paces and learning the difference between over steer and under steer. 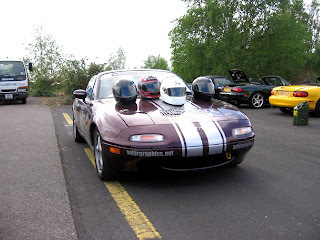 The Merlot was joined on track by 5 other MX-5s on this occasion with Eastern Region regular track day fans Ken Ward and Brian Hoskins putting their own cars through their paces. The day also saw the first track outing for Ian Ward’s track day MK1 which he had been working on in secret for the last few months. The line up of 5s was completed by Eastern Region member Ben Edwards in his red MK1 and a “special guest” appearance on the handling circuit by David aka “Captain Muppet” in his matt back MK1 which he is currently competing with in the 2007 Eurodrift Pro-Am Championship. Thanks to Javelin for another brilliant day at Woodbridge. We will be back soon. Project Merlot had its first trip to a sprint circuit on Saturday 2 June. Regular drivers, Jon, Robbie and Martin were joined by new girl Katie Pyle at the famous Curborough venue in Staffordshire. 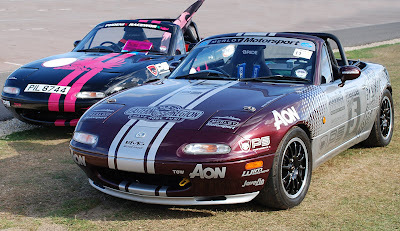 The MX-5 Owners Club hold a non competitive fun day at Curborough every year on which the sun always seems to shine. Team Merlot at Curborough the Movie. It was a very busy day for The Merlot boys on Saturday 28 April. The morning saw Jon dashing to Ilford to visit our latest sponsors Dandycars.com. Its great to have the support of someone else so enthusiastic about Project Merlot. Martin's morning got of to a hectic start (selling a Fiat!) followed by a dash to EMG Cambridge with Jon to meet up with Robbie and pick up the Merlot for the start of the weekends work. How can you get lost going to Woolpit? (Well we did!) The plan for the afternoon was to get a head start on The Eastern Region Tech planned for Sunday at which the Merlot was to get its new suspension bushes fitted (donated by Performance 5). The first set of bushes were easy and we began to wonder why another well know Mazda track car team found it so hard! When we got stuck into the second set from a rear lower wishbone we found out how hard it can be! We only broke the one 150mm heavy duty G cramp but the end result of an afternoon work planned to get one side of the car complete saw us get just half of 1 wheel done. Nevermind, there is always tomorrow and with lots of help from the guys at the Tech day and fortified by lots of sausage rolls we will no doubt succeed (fingers crossed!). 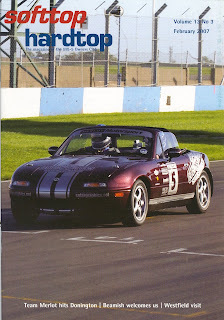 Project Merlot is heading for its first airfield track day on 5 May 07. 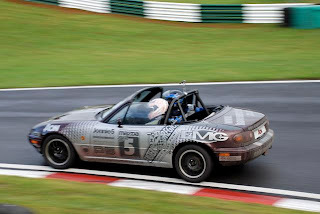 Once again the car will be driven by members of the MX-5 Owners Club Eastern Region with another 2 new drivers this time. The Woodbridge Airfield is fairly new to the track day scene but the events there so far, organised by Javelin Trackdays, have proved a big success. 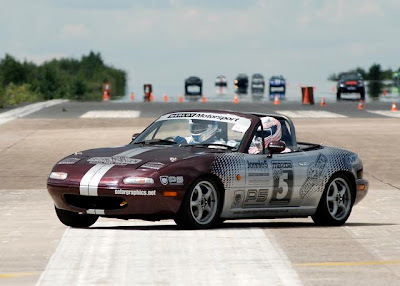 Javelin are big MX-5 fans themselves with their very own "MX Experience" which gives people the chance to hire track prepared MX-5s and put one of the greastest sportscars through their paces. There’s been No track action for Project Merlot in April but both the team and the car have still been busy. The car, driven by Robbie Marsh, took part in the OC Eastern Region annual pub hunt on 1 April and was quite a sight as it dashed around Suffolk from pub to pub as part of the “MidnightWaterPumpers” team in the company of Steve Hiders competition winning white roadster. April has also seen some further sponsorship developments. 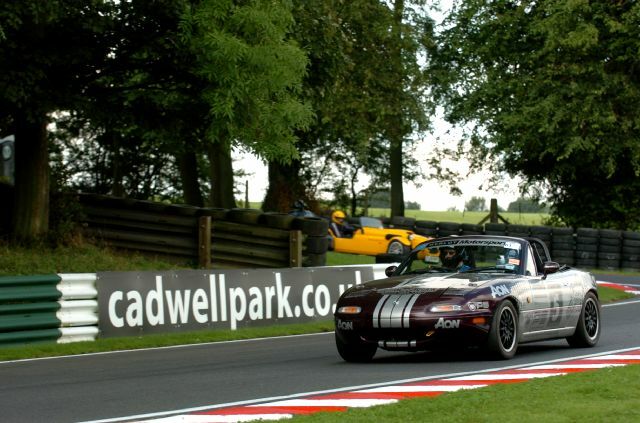 Team Merlot are now pleased to have Performance5, the top UK MX-5 performance specialist, as a main sponsor. http://www.performance5.co.uk/. This month has also seen a further appearance in the national media with a photo of the car on the track at Donnington Park and a write up in the news section of the May issue of Classic and Sports Car. 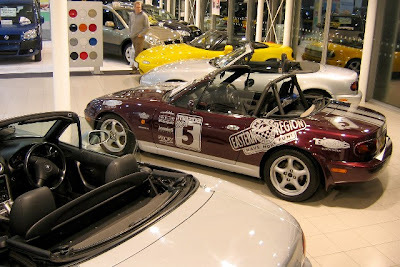 This is the second time the Merlot has appeared in C & SC having been spotted in a write up on the MX-5 Owners Club 2006 National rally in Lincolnshire where the car made its first public appearance back in September. 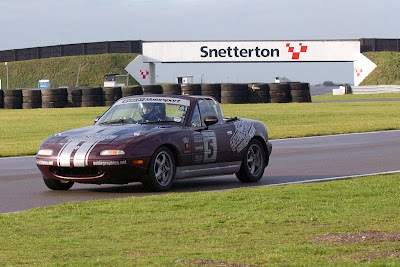 The bad news for April was the discovery by Robbie of the terrible state of the brakes after the Snetterton track day in March. Robbie described the front brake pads as having “melted”, with “globules of molten metal” having “scored the discs” and “the rear brake pad material having come completely away from their back plates”. 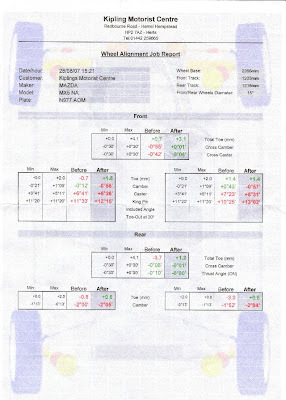 All sounded a bit technical to me, I just used the brakes to slow down a bit before the corners, as you do!